Battle Vision™ cuts the glare so you see much clearer in a stylish, unisex design. Made with shape-memory polymer, Battle Vision™ delivers unrivaled flexibility. Soldiers depend on clear vision to hit their targets. Now you can get the same HD clarity. For crystal clear vision when it matters most, you need Battle Vision™ by Atomic Beam™. READ FULL DESCRIPTION Made with high-tech polarized lenses, Battle Vision™ helps you see objects you can't see with the naked eye. That's why soldiers depend on sharp clarity, like you get with Battle Vision™. These unisex polarizing sunglasses instantly eliminate glare, enhance color, and provide your eyes with UV protection. You'll see much clearer wearing Battle Vision™! Whether you're shooting outdoor photos, walking the dog, playing a match of tennis, or hiking, these sunglasses are a must-have! 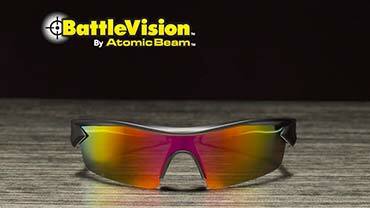 Battle Vision™ is built Atomic Tough. Its shape-memory polymer delivers unmatched flexibility. The frames snap back to its original shape. Perfect for wearing while driving your car or riding your motorcycle, while hunting, fishing, jogging, sports, walking the boardwalk, or any other outdoor activity! Battle through the glare and see clearer than ordinary lenses alone in these stylish, unisex polarized sunglasses. Get your Battle Vision™ by Atomic Beam™ for only $19.99 plus $7.99 shipping and handling As our gift, we'll include a SECOND Battle Vision™, ABSOLUTELY FREE! Battle Vision™ is made of shape-memory polymer that delivers unmatched flexibility. Battle Vision™ has high-tech polarized lenses that help you see objects the naked eye can't see. When you wear Battle Vision™, colors look brighter and your eyes are protected from harmful UV rays.